5. We can also be designed and produced according to the customer specifications. Copper Drier, Strainer, Muffler & Filter for Air Conditioner, Refrigeration and Freezer Applications. - The above drawing and data of sheet for the reference only. - Welcome any OEM and drawings requirements. These economical copper filter drier is recommended for hermetically sealed systems up to 4,000 BTU/hr capacity. They can be used with all common refrigerants and blends. They feature extended ends for easy soldering and a surprisingly high moisture absorbing capacity (30 drops). Air conditioning, heat pump, and refrigeration systems. All copper contruction for corrosion resistance and simplified brazing. Compatible with commercially available refrigerants and lubricants. 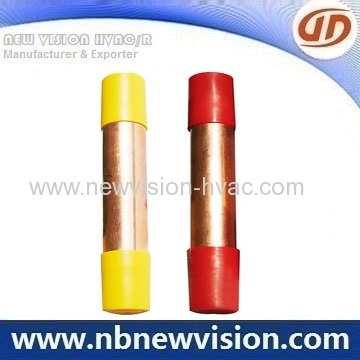 Connection size: 1/4" to 5/16"
5g, 7g, 7.5g, 8g, 10g, 12g, 13g, 15g, 18g, 20g, 25g, 30g, 35g, 40g, 50g, 60g, 70g, 80g. 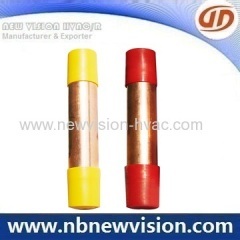 In case of more assistance for copper filter drier, welcome to let us know any time.